There were amazing testimonies of reconciliation at Reignite, but none so dramatic as Liz and Chris. 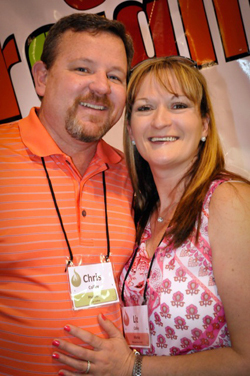 They recently remarried after she served time in prison for placing a hit on Chris' life. She came to Christ and kept in touch with their little son. When Chris saw the new Liz, he forgave her. They are very much in love, and their family is reunited. Her mother-in-law welcomed her back into their family. She hugged Liz and whispered in her ear, "Now our family is complete." Miracle working God! He gives beauty for ashes. The oil of joy for mourning and a garment of praise for a spirit of heaviness. Thank you for providing the resources for this growth spurt. We need your partnership and prayers. Under the flow of His amazing grace.